L: 72" x W: 18" x H: 39"
Drake 72" Media Credenza Give your living room a classic touch with the Drake 72" Media Credenza. This beautiful piece is finished in a painted metallic color giving it a touch of shine. Traditional bun feet paired with stained-glass look doors create a conversation started in any living room decor. Give your living room a classic touch with the Drake 72" Media Credenza. This beautiful piece is finished in a painted metallic color giving it a touch of shine. Traditional bun feet paired with stained-glass look doors create a conversation started in any living room decor. We are loving the Drake Media Credenza. The color is perfect, fits perfectly in the space we had left to fill, and is great for extra storage! This Media Credenza and it’s color fitted the yellow accent wall perfectly. The design of glass doors provides a look of elegance and the storage space is adequate for tec devices and a bar. Thus is an awesome addition to our family room. Great color and texture. Great little piece for our kitchen! Does exactly what we needed, and looks fashionable to boot. Shipping was fast, it came as advertised, no issues. I recently had an insurance issue and had to tear down a mirrored wall and pull out flooring it was a disaster. I was looking for a piece of furniture for a focal wall and when I saw this I immediately knew it was going home with me. The delivery was fast with no problems at all. 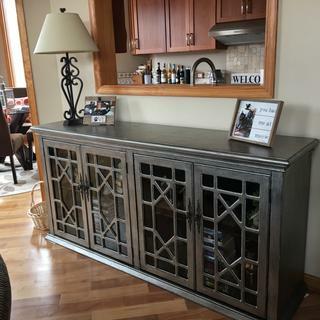 Beautiful cabinet with lots of storage! Looks great with the Daine sectional and chair we recently purchased. Love the color and functionality. A great value! This piece looks absolutely beautiful in my living room. So many compliments on it plus I can display my books, glass pieces etc inside & they can be seen perfectly. Looks better in real life. In a rush we were looking for the perfect TV stand for a 65” TV purchased Saturday before our Eagles playing in Super Bowl that Sunday - needed the perfect stand in a hurry - went in 4 stores before R & F Andy so thankful we saw this beautiful piece! Solid - Quality- perfect height and width and loved the Metallic distressed finish! So cool - and lots of space inside to fit our receiver- DVD - Comcast Box and even speakers and DVD collection! So elegant yet unique and edgy and what a fantastic price - saw it online elsewhere for over $1k - and they professionally delivered it Tuesday (3 days from purchase) giving us plenty of time to set it all up with system before Super Bowl Sunday! Yes we watched our Eagles win it all with new system and this great piece! Looks great - exactly what I needed! Looks great - exactly what I wanted. David, thanks for your review and the photo. The credenza look beautiful in your space. Picture albums on and on. I am able to display decoration piece on top of & in the glass windows. do the legs come off? Can someone tell me the dimensions of the interior shelves? thank you! BEST ANSWER: The dimensions of the interior top shelves are L: 33" x W: 14.5" x H: 14" (each). The dimensions of the interior bottom shelves are L: 33" x W: 15" x H: 15"